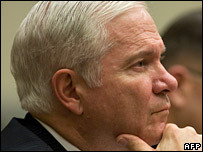 Many Nato allies are failing to pull their weight in the battle with the Taleban in Afghanistan, US Defense Secretary Robert Gates has said. "I would like for all of the allies to be involved in a comprehensive strategy that involves both security and economic development," he said. He was speaking in Edinburgh before a Nato meeting on Friday. Most of the fighting against the Taleban has been carried out by British, US, Canadian and Dutch forces. It is an open secret that the United States is frustrated with the unwillingness of many European allies to commit their troops to the front line. Mr Gates refused to name those countries which, as he put it, had failed to step up to the plate. But the BBC asked him whether he was disappointed with the performance of Germany. "The Germans have a considerable presence in Afghanistan," he said. "They are in an area that does not have a lot of violence, and so the requirement on them to engage in combat has not been as significant as those of us who are in the south and the east." Mr Gates also said he would call upon Nato defence ministers to overhaul the organisation's entire strategic approach. An organisation that was designed to meet the threat of a massed Soviet invasion of Europe now faced the challenge of a prolonged counter-insurgency in far-flung areas of the world, he said. He wants a new strategic plan to be agreed in the next few months. He said he did not share the pessimistic view expressed by some British officials that Nato should now recruit on the assumption that it will still be at war in Afghanistan 10 years from now.